How Palmer Woods became one of the largest protected pieces of land in Leelanau County reveals something deep about our love of wild places. This article is featured in the November 2017 issue of Traverse Northern Michigan’s Magazine. Get your copy. Many people—even those who love the land the most—struggle to put into words what’s so remarkable about Palmer Woods. The attempts naturally seem to get hijacked by words and phrases like “majestic” or “there’s just something about it” or “you just have to see it for yourself.” All of which, while inadequate, are still true. But the man who spent much of his life there can articulate it quickly, clearly, even poetically at times. There’s awe in Dan Palmer’s voice when he talks about the resilience of the northern hardwood forests—land that was once clear-cut of virtually every tree and yet in the matter of several generations, recovered to be one of the fastest-growing forest ecosystems in the world. Or when he recalls the improbable set of events that allowed him to slowly acquire hundreds of acres of forestland that now support rare predators like bear and bobcat. Or when he remarks on the subtle personality quirks of the property’s deep glacial valley—like how the mix of trees, wildflowers and ferns on its two contrasting slopes depends on whether they favor morning or afternoon sun. You can hear it most in the way he talks about “the woods”—a two-word phrase that instantly and accurately translates his sense of wonder to anyone who spent any part of childhood in a Northern Michigan forest. When he mentions it, the now 87-year-old is clearly recalling memories from his own youth: “I grew up in Frankfort, and I’d sleep overnight in Sleeping Bear with just a blanket and a fire. Some people like the beach and the sun. I like the woods.” Though he’s quick to add the postscript that his woods are not as beautiful as they once were. That there’s even a contiguous woods to reminisce about is something remarkable itself. Palmer says he bought his first piece of land in Leelanau County in the early 1970s. And slowly, and in a fashion that would be impossible today, bought up parcel after parcel until he found himself in possession of 20 adjoining lots, totaling 750 acres of mostly hardwood forest. Seeing that one landowner owned a rather large chunk of the Leelanau Peninsula was equally remarkable to the fledgling Leelanau Conservancy, founded in the late 1980s with a mission of protecting land and water resources in the region. As is a standard practice among conservancies, one of its very first steps was to use maps and public records to scout land with conservation value. Dan Palmer quickly became a key person of interest. In Dr. Palmer, Price found an open-minded audience for the conservancy’s values. Palmer, who was a dermatologist by training, was also an amateur timber man and botanist. (In fact, Palmer is considered one of the foremost experts on ferns of Hawaii, where he spends half the year; and University of Michigan Press is publishing his new book on Michigan ferns in the spring of 2018). He quickly became one of the organization’s earliest supporters, though conversations about preserving his own land were generally casual—and remained so for several decades. But in late 2013, during one of the conservancy’s routine visits with the Palmer family, the doctor dropped the plot twist no one saw coming. 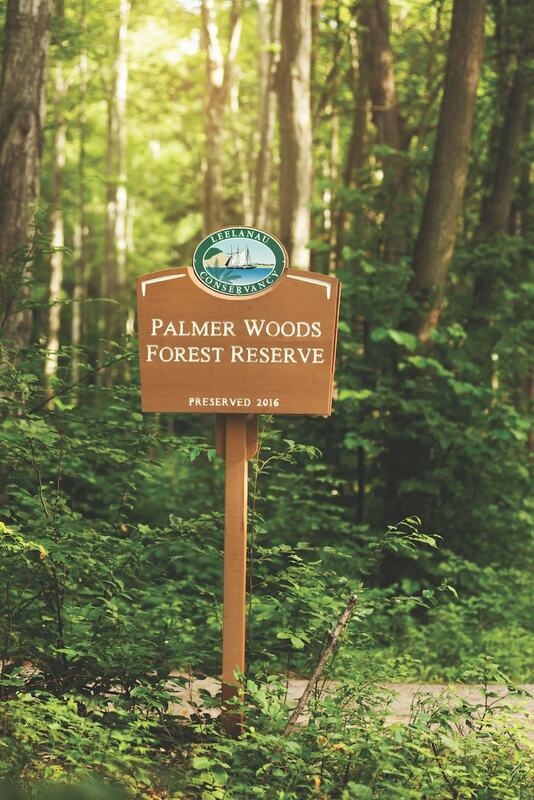 Dr. Palmer’s woods were situated in a prime development spot, flanked by Sleeping Bear Dunes National Lakeshore to the north and the quiet resort town of Glen Arbor to the west. As such, it was worth millions to residential real estate developers. Typically, Nelson says, when a landowner wants to preserve a piece of land, and the price tag is too high for the conservancy to buy it outright, the organization uses a tool called a conservation easement. This leaves the land in private ownership (and on the local tax payrolls), but protects the land against future development. But for Dr. Palmer, who by this time had transferred ownership of the land to his children, a conservation easement wasn’t an ideal option. His children lived elsewhere, and needed to recoup the value that would come from a market-price sale of the land. The family would prefer it go to the conservancy; but they couldn’t afford to give it away or let it go at a discount. 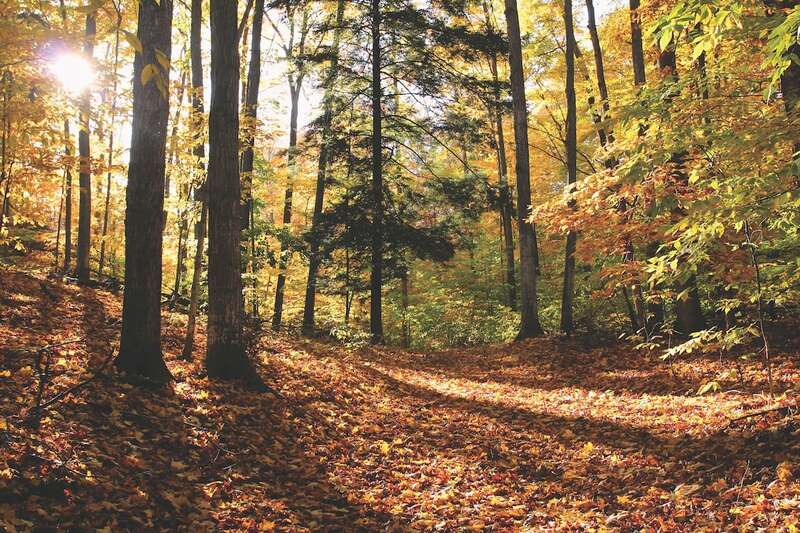 Though buying Palmer Woods was what Nelson calls an obvious “once-in-a-lifetime” conservation opportunity, it was also one that the Leelanau Conservancy approached very cautiously. For starters, it would be the largest and most expensive project the organization had ever taken on—and they didn’t have the more than $3 million needed for purchasing the property lying around. Both the massive fundraising campaign and their eventual management of the property could just as easily fail as succeed—maybe even cripple the group’s ability to preserve other properties or set back their reputation. More fundamentally, Nelson says the group honestly debated whether people in the region had an appetite for the project. Ultimately, the conservancy decided it was too big an opportunity to pass on, negotiating and option to buy the property that gave them a six-month window to raise the money. From there, Nelson says his job—and that of many others—became “all Palmer woods, all the time.” And the woods themselves became a key tool for getting buy-in for the project. The conservancy had hoped to raise about $2.5 million of the total price by July, and by June, they were closing in on the goal with donations from larger donors. To put them over the top, they announced a public phase of the campaign—during which it became clear that people did indeed have an appetite for preserving more of the Northern Michigan woods. (As a longtime supporter of the conservancy, Dr. Palmer even kicked in a sizeable donation.) The conservancy’s plan to voluntarily keep the property on the local tax payroll also helped them gain the support of local townships. Even the Glen Lake Association jumped on board. 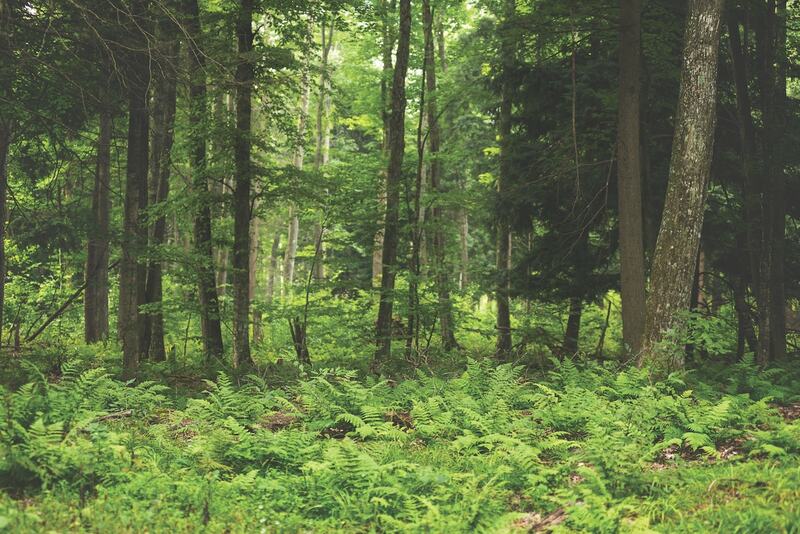 By the middle of the summer, the deal which hadn’t even been on the conservancy’s radar a few months ago, was done, and more than 700 acres of prime woodland in Leelanau County would be forever protected as a natural area. It was a huge accomplishment for the conservancy, ranking as the largest protected land in the county outside of Sleeping Bear. Produced by The Boardman Review, the creative culture and outdoor lifestyle journal of Northern Michigan. Click here to subscribe for free to the digital issues, and/or purchase current print issues on the website store here. For news on upcoming events and issue launch parties, follow The Boardman Review on Instagram and Facebook. But in some ways, Tom Nelson says the effort to save Palmer Woods is just beginning. Today, it’s not only development pressure that’s threatening Northern Michigan’s wild places. 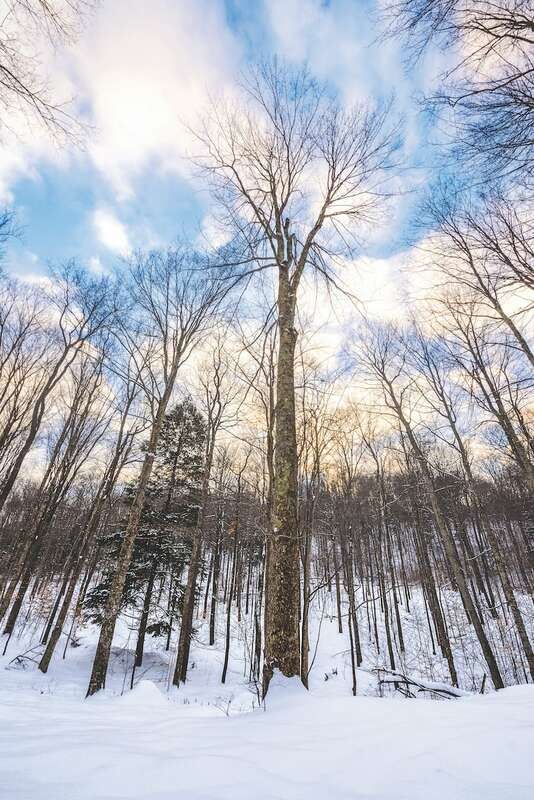 In the last decade, northern hardwood forests have, in particular, been struggling to cope with new pests and diseases, explosions in the deer population, and climate change. A recent report by the Michigan DNR found that nearly 50 of the 62 “high impact” invasive pests in the U.S. are now established in the state—a trend that hasn’t escaped the notice of Palmer Woods’ chief advocate and historian. The conservancy is hoping the woods themselves can become a key to understanding these new threats to the forests. They’re currently working with universities on a number of research projects, including studying several deer “exclosures”—huge fenced in areas which allow all wildlife but deer to enter and exit the area. They aim is to investigate how deer overpopulation is impacting the ability of small trees to renew forests in areas transformed by 2015’s major “blow down” event, where hurricane-force winds levels dozens of acres of the region’s forests. 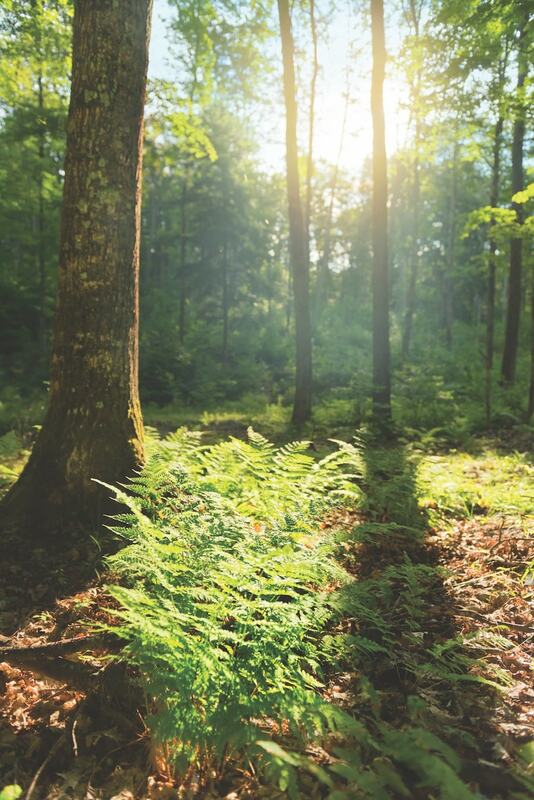 They’re also hoping to pioneer new models of sustainable forestry on protected lands, which could unlock new practices for financially supporting conservation projects long-term. 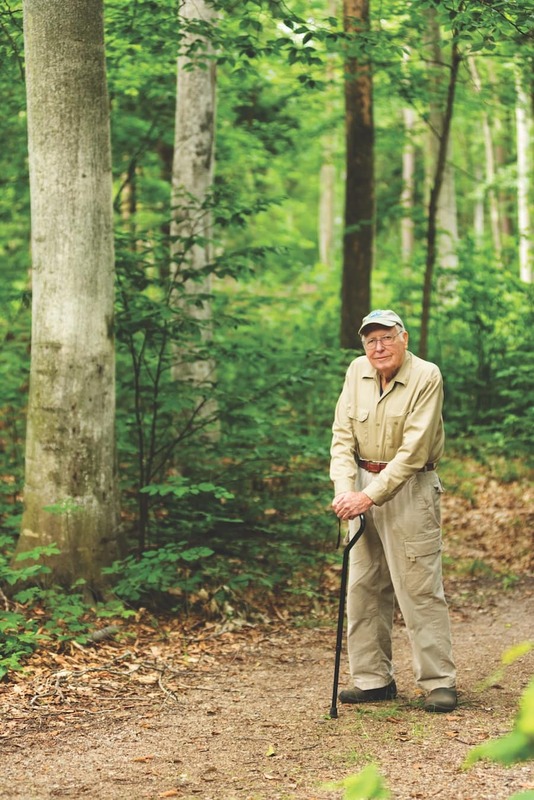 But ask the conservancy’s Tom Nelson about the biggest lesson he’s taking away from Palmer Woods and he’ll tell you a story about his childhood—a story that also reveals something about the connection people in Northern Michigan feel to their forests. Nelson grew up, he says, in a community in another Great Lakes state—a place, which, in the course of about a decade and a half, erased most of the farmland and forestland that shaped his youth. He recalls at the time asking his father, who he describes as a businessman but also a conservationist at heart, why all this was happening. Lou Blouin is a radio producer and print journalist working in Detroit. lou.blouin@gmail.com // Heather Higham is a landscape and portrait photographer based in Traverse City. snaphappygal.com.